UPDATED: Sat., March 24, 2018, 1:53 p.m.
HOUSTON – Large-scale projects long considered essential to easing Houston’s flooding woes went to the top of the area’s to-do list after Hurricane Harvey inundated large swaths of the nation’s fourth-largest city. Seven months later, local officials are still looking for funding to undertake plans that include a new reservoir, deeper and wider bayous and a coastal barrier system – all of which have fallen victim to a lack of money or political will in the past. Yet local leaders insist this time will be different, saying they’re committed to making the projects a reality, even as they wait to find out how much money they might get from the state and federal governments and whether local taxpayers will be willing to help out. “There’s been a whole lot of talk over the years, but now it’s time to get it done in the post-Harvey era,” Houston Mayor Sylvester Turner said at a recent community meeting. One thing that’s giving Turner and others hope is that billions of federal dollars have been allocated to pay for flood-mitigation projects. The Federal Emergency Management Agency has promised $1 billion for areas affected by Harvey, though Houston will be competing with other Texas communities for that funding. Congress in February provided $15 billion to the U.S. Army Corps of Engineers for flood-control projects nationwide, some of which could go to the Houston area. Houston, which was founded on the banks of the Buffalo Bayou around the mid-1800s and rises barely above sea level, has long been susceptible to flooding. But recent growth has made the problem worse. The area has more pavement, which generates more stormwater runoff, and has lost wetlands that could soak up that runoff. Big projects Houston-area officials are eying include building a third reservoir for the area, at a cost of about $500 million. 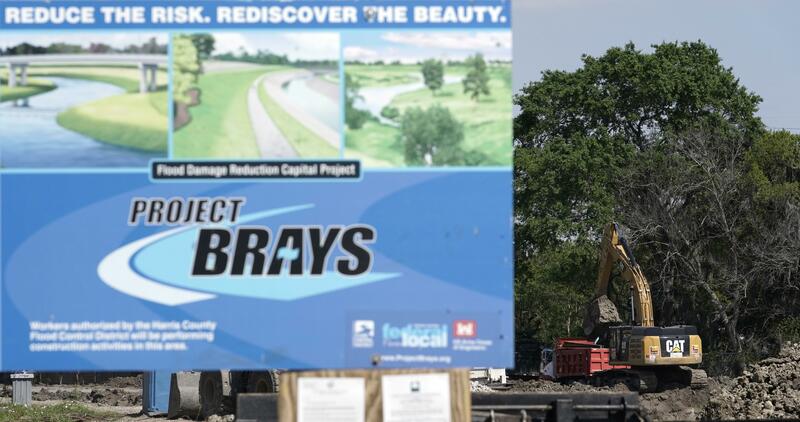 They also want to complete the excavation and widening of six local bayous, a $1.3 billion project, part of which has proceeded in fits and starts for more than 20 years due to inconsistent funding. And they want to undertake a project known as the coastal spine, which was first proposed after Hurricane Ike in 2008. That $6 billion to $10 billion project – also called the “Ike Dike” – proposes barriers to protect the area from storm surge coming into Galveston Bay. This “will be very different than the last several decades when things were thought of but never actually executed,” said Marvin Odum, Houston’s Hurricane Harvey recovery czar. Whichever projects are ultimately funded, they will likely take years to build. Turner and other Houston-area officials have asked Texas Gov. Greg Abbott to use the state’s $11 billion rainy day fund to help front the cost of building the reservoir and other projects, with the state being repaid once federal dollars are awarded. But that message has “fallen on deaf ears,” said Stephen Costello, Houston’s chief resilience officer. However, Ciara Matthews, a spokeswoman for Abbott’s office, said Saturday that through the governor’s work with Congress, “a record amount of funding is now available to Houston to rebuild and restore the reservoirs and bayous, as well as building the coastal spine. “He has also made available a billion dollars in hazard mitigation funding for the city and county right now,” Matthews said, referring to the money from FEMA for areas affected by Harvey. Harris County Judge Ed Emmett, the top elected official in the county where Houston is located, said he’s not reassured by promises from state officials. He also noted that they’ve pushed to cut property taxes, which Harris County uses to pay for its flood-control efforts. “When somebody at the state level tells you that they’re going to lower the property tax, what they’re telling you is, `We are not going to build many flood-control projects,“’ Emmett said. Officials are also asking Harris County residents to approve a $1 billion to $2 billion bond proposal to help pay for some projects. That will be on the ballot sometime this year. Texas A&M University at Galveston marine sciences professor Sam Brody cautioned that Houston and the rest of Texas can’t engineer their way out of flooding issues by only relying on large-scale projects. Efforts such as buying out homes in flood prone areas and being mindful of future development must play a role in making the area more flood resilient, he said. Houston remains the only major U.S. city without zoning, but it does have rules about building in the flood plain. The City Council is set to vote in the coming week on stricter rules. Harris County approved new restrictions late last year. Both Houston and Harris County are also pursuing a home buyout strategy. “There is no one silver bullet that is going to fix this problem,” Brody said. “It’s a … multi-strategy issue that people need to recognize,” he said. Published: March 24, 2018, 10:22 a.m. Updated: March 24, 2018, 1:53 p.m.